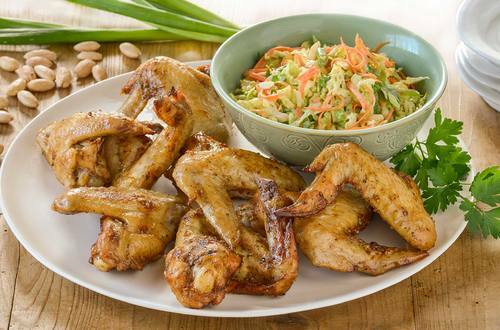 Create a tasty and light summer lunch or dinner with our garlic and herb chicken wings recipe with a coleslaw on the side. Prepare and cook in just 40 minutes. 1 Preheat oven to 180C. Place chicken wings in the bag and add Recipe Base, seal with tie provided and gently rotate to cover. 2 Place on a baking tray and cook for 30 minutes. 3 Combine cabbage, carrot, spring onions and mayonnaise and mix well. Top with almonds. 4 Serve chicken wings with the coleslaw.